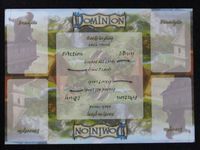 A thin play mat for Dominion from Spielbox Magazine 1/10. There are two halves, so one must cut it into two mats. One side is in German, the other side in in English.